You typically don’t get paid in cash. You buy many of you items online where cash is not a payment option. And, last but not least, cash sitting around in envelopes just isn’t all that safe. Fortunately, there’s a simple one-for-one digital replacement for the cash envelope: a reloadable prepaid card. Instead of separate envelopes for each budget category, just use separate prepaid cards adorned with custom labels. Just like physical cash stuffed in an envelope, a prepaid card won’t permit overdrafts (like a bank card) or debt (like a credit card). by making an instant, free card-to-card transfer within the same network. So prepaid cards are the envelope budgeter’s perfect digital alternative, right? You’ll be juggling quite few cards. If multiple family members are making purchases, you’ll have to remember to hand the right cards off to one another. And, you may be stymied by the rare in-store merchant who checks the cardholder name carefully. When you revise your budget categories, you’ll have to order more cards accordingly. The bottom line: FamZoo families have told us that the simple card-per-envelope solution only works well for limited scenarios like spend-save-give envelopes for their kids. It’s just too unwieldy and rigid to gracefully handle the broader household budgeting scenario. A couple months ago, one of our users, Casey, came up with an innovative digital system that really does work for the broader household. He figured out how to use our unique IOU accounts to represent the digital envelopes while still using just one prepaid card per family member to make the purchases. A brilliant combo! 1. Order one primary funding card for the family and one spending card for each family member. For example, a couple with one child would have four cards: the primary funding card, a spending card for mom, a spending card for dad, and a spending card for junior. We'll elaborate on how the primary funding card interacts with the individual family member cards below. 2. Set up IOU accounts for your household budget categories. 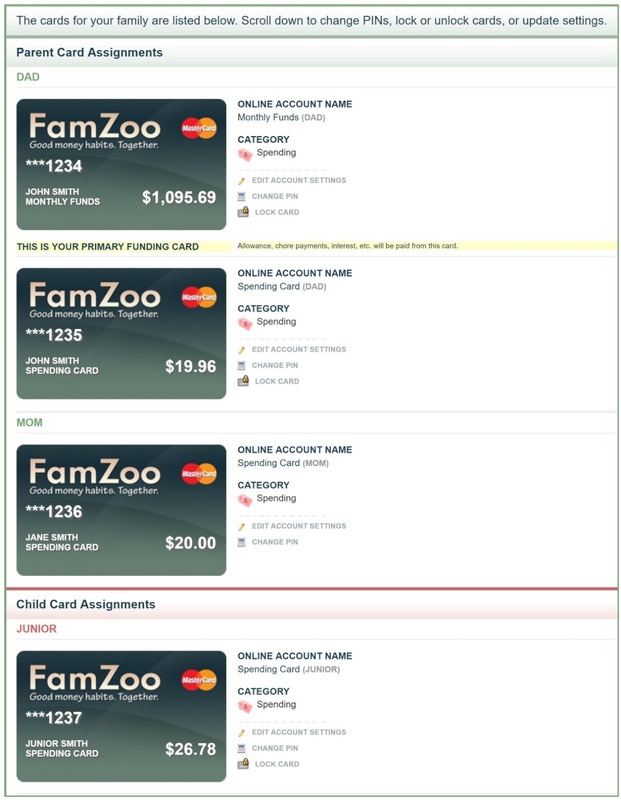 In this system, a FamZoo IOU account serves as a virtual envelope. 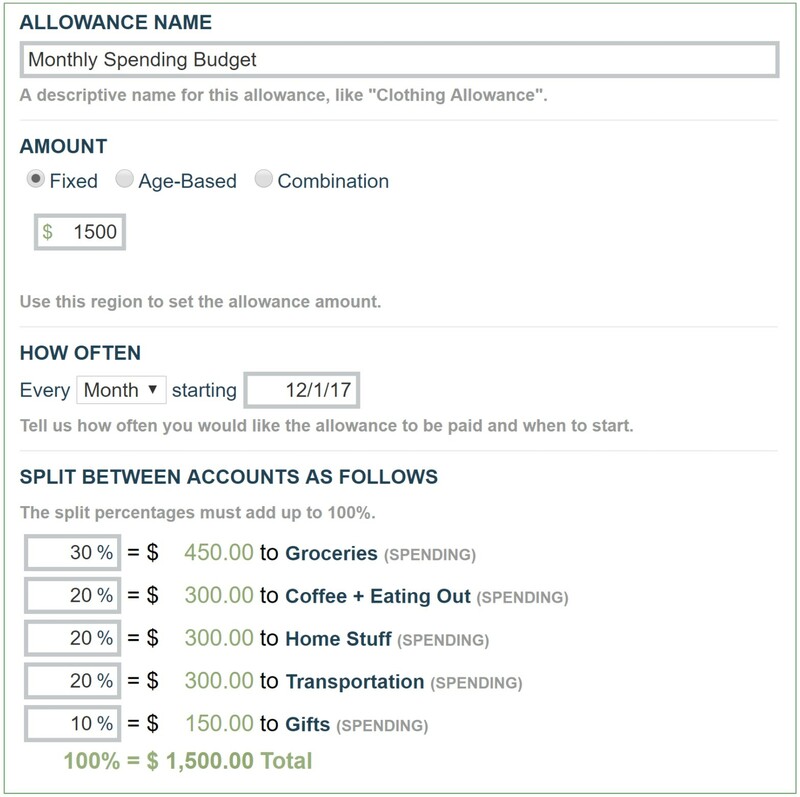 Create one for each envelope or spending category. The current balance represents how much money is remaining in the digital envelope. So, if the Grocery IOU account balance is $65.33, that’s how much your family has left to spend on groceries for this cycle. Pro Tip: Casey set his IOU accounts up under a fake family member named "Budget" so he can see the subtotals and grand total for his remaining budget in one convenient place. 3. 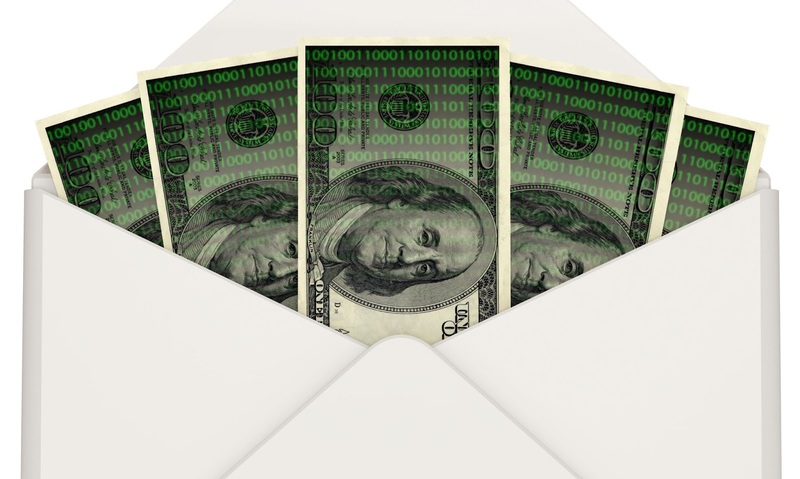 Fund the envelopes automatically with an allowance. Create an allowance that allocates the right portion of the budget to the right IOU account on the right schedule. For example, an allowance might allocate $450 to the Grocery IOU account each month. Taken together, the allowance allocations add up to your total budget. Pro Tip: If you get paid twice a month, and you want to synchronize the funding of your envelopes with your paycheck, create two separate monthly allowances that each allocate half your budget. Stagger the start dates to be on the right days of the month — like the 1st and the 15th. 4. Load the primary funding card each cycle. Tally up the allowance allocations, and load the total amount onto your primary funding card each pay cycle. Pro tip: If your bank or credit union supports it, use a scheduled bank transfer within your online banking application to load your primary funding card. That way, you can set it and forget it — at least until the next time you adjust your total spending budget. 5. Transfer funds from the right envelope before each purchase. Here’s where the FamZoo secret sauce comes in. It’s based on our unique rules for handling transfers between IOU accounts and prepaid card accounts. When you transfer an amount from an IOU account to a prepaid card account, you’re converting an IOU into cash. That cash has to come from somewhere. So, it comes from your family’s primary funding card. the family’s primary funding card decreases by $100. You’ve just drawn down your digital grocery envelope by pulling funds from the family funding card onto an individual spending card. 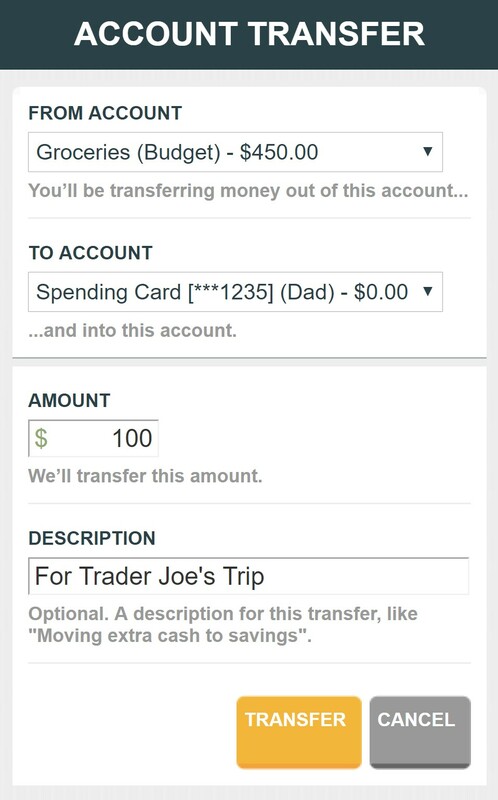 Now you’re cleared to make your $100 grocery purchase on the “Dad Spending” card. 6. Return any change back to the envelope. What happens if you only spend $95 dollars on groceries instead of $100? Just transfer the excess $5 on the spending card back to the right envelope. Behind the scenes, the $5 will flow back to the family funding card while $5 is credited to the envelope. It’s just the inverse of what happened during the transfer before the purchase. 7. Roll over any surplus each cycle. At any given time, your IOU account balances show exactly how much you have left to spend in each budget category. What if you get to the end of the cycle and still have a net surplus in your envelopes? You could transfer the surplus to one or more envelopes for extra spending in that category next cycle — like maybe the “Fun Money” envelope. Or, you could move the surplus amount off your family funding card into a savings or investment account. If you do, just debit your envelopes to zero before the allowance hits for the next cycle. That’s it: A robust envelope budgeting system that works for families living in the modern, digital world.